Law blogger: Do you blog because you are trying to engage with in-house counsel, journalists, prospective clients, and other interested parties? And how is that going for you? In my earlier post on the GreenTarget survey findings that showed in-house counsel read blogs, I argued “but are they reading your blog?” On Twitter last week, Kevin O’keefe, @kevinokeefe, challenged me on that statement and suggested that I was missing the point. He believes the reason to blog is not to publish content, i.e., read, but rather to get the audience to engage with you. I’m a realist; to engage, you must be engaging. Arguably, if the audience doesn’t find the content attractive enough to read through the post, then there’s nothing there to discuss. They move on. That’s why I believe that bloggers should first focus their attention on improving their content and the engagement will follow. Of course, it’s possible that your audience is not comfortable with public discussions online and there may never be a great influx of online conversation generated. But, if in-house counsel are reading law blogs, as GreenTarget’s survey suggests, then at least you will be presenting content that people want to read: well-written content with excellent structure—the ingredients every blog post needs. I believe that the visit duration to many law firm blog posts is closer to seconds, rather than minutes—not enough time to read a 300 word post. If this is true, then a majority of law blog posts are not being read. And that can easily be fixed. Improve your content. 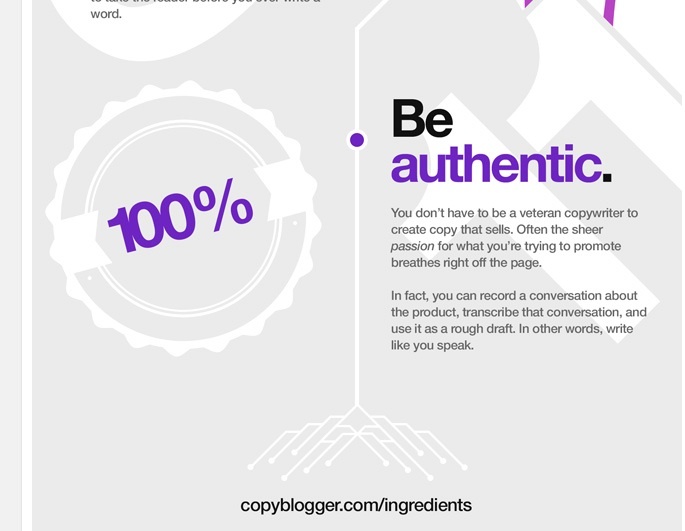 Here is a handy info graphic from copyblogger showing the essential ingredients that every blog post needs. (Thanks copyblogger for letting me use your great info graphic!) Print it, memorize it, check each post against these ingredients before you hit publish. And let us know if you don’t see a difference. I’m pretty sure that if your content is top notch, your readers will stay on your blog long enough to read it and maybe they will “engage.” Readers have precious little time to waste on a page full of text; a long boring post that leaves them empty handed. Give them something engaging. Jayne – Great post. I’m definitely in your camp on this idea of making blogs work by great writing. In fact, anything less than riveting text and images with keyword rich content is simply talking to yourself in a dark closet. Lawyer bloggers have to disconnect their brief-writing circuit to allow more of a story-telling style to come into play. I tell them to think of a blog as a closing argument, rather than an evidentiary hearing.